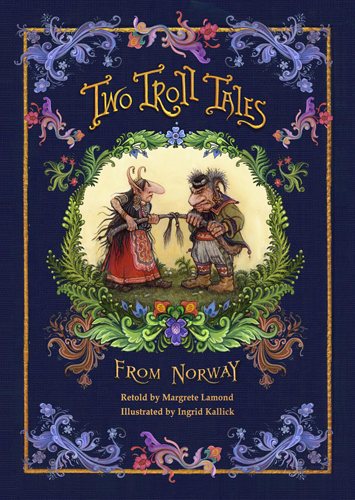 Margrete Lamond’s enchanting retelling of The Two Troll Tales from Norway is sure to attract educators and booksellers around the country. The first of the pair of folk tales in the collection, ‘The Little Old Lady from around the Bend’, is the story of an old lady who, in her younger days, wrongly bargained with and deceived a family of trolls. The tale demonstrates the repercussions of not listening to what you’ve been told (a great lesson for children who don’t listen to their parents, although hopefully they won’t lose an eye!). The second fold tale, ‘The Golden Ball of Yarn’, tells the story of a man who is deceived by the Huldra—siren-like creatures who live in forests and feed the men they’ve captured in order to keep them in their clutches. The comedic end to the story leaves you stunned but wanting more. Both stories are retold from 19th-century Norwegian writer P C Asbjornsen’s collection of folk tales, and are beautifully complemented by the rich, rustic colours in Ingrid Kallick’s illustrations. The simple language may not challenge advanced readers, but will be a great starting point for young bookworms in the making.